I was so excited about this final installment of this series. Though it’s not exactly a favorite, it is definitely worth a read. I really enjoyed listening to the audiobooks and this particular one didn’t disappoint. I’ve really become invested in the characters, especially Clary, Jace, Simon, and Alec. 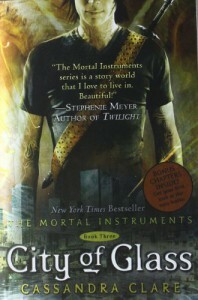 I didn’t really like Alec much at first, but I really warmed up to him in this book. He’s pretty cool and he comes into his own in this one. It was a little frustrating to watch Clary and Jace struggle with their relationship. I understood why they were acting the way they were, but somtimes they would be so cold to each other and it was kind of annoying. Simon was the most surprising of the characters, as far as growth goes. He also comes into his own. He stands up for the people he loves and what he believes in. He became a really strong character by the end of this book. Though I’ve enjoyed these books, there was still something about them that kept them from becoming favorites. I think I liked the idea of the plot. I might have enjoyed it a little more if it didn’t have that casual YA style that I’ve been coming across. It’s more about the writing than anything. I just wanted the writing to be a little more formal. I’m not sure why. I just think it would have lent itself better to this story. The plot was some predictable. I like it when I don’t know what’s going to happen next. I like being surprised. I guessed a lot of things that happened in this book. I was only surprised a few times. I think the plot itself and the characters I loved saved it from me being too critical about the predictability. All in all, it was a really good series. I recommend it to anyone who’s interested in YA fantasy. I really liked Natalie Moore. I was so excited when she took over the narration of the second book. She was perfect, and I never hated the voices she gave the characters, the way I hated Ari Graynor’s voices. It’s a good choice for an audiobook listen.